FARGO, N.D. – The Fargo-Moorhead RedHawks out-hit the St.Paul Saints, but needed a play at the plate to hold off the Saints and pick up a 5-4 exhibition victory on May 10 at Newman Outdoor Field. The RedHawks began the ninth with a 5-2 lead but that was cut to one run after a Willie Cabrera double scored Brad Boyer and Donald Blunt. With two outs, Saints third baseman Joey Becker hit a liner up the middle into center field. Cabrera attempted to score from second, but wound up being thrown out by RedHawks outfielder Nick Akins on a one-hopper to catcher Todd Jennings. Fargo-Moorhead improves to 2-2 in exhibition play with the victory. Buddy Sosnoskie and Keith Brachold had three hits apiece, while combining for three RBIs. Tim Alberts went 2-for-4 with two RBIs and Jose Garcia also had two hits with a run scored. Taylor Stanton started for the RedHawks and pitched three 1-2-3 innings. Alex Sunderland earned the victory after pitching two scoreless innings of relief, allowing one hit and picking up a strikeout. Pete Levitt pitched 1-2-3 seventh and eighth innings and Chris Squires earned a save pitching the ninth for the ‘Hawks. Jose Hernandez led the Saints at the plate with two hits and had two RBIs on a double in the fourth that originally tied the game at 2-2. Starter Danny Gutierrez threw three innings giving up two earned runs on three hits, while striking out five. Matt Bruback gave up one earned run and three hits in three innings of relief, but was the pitcher of record for the loss. 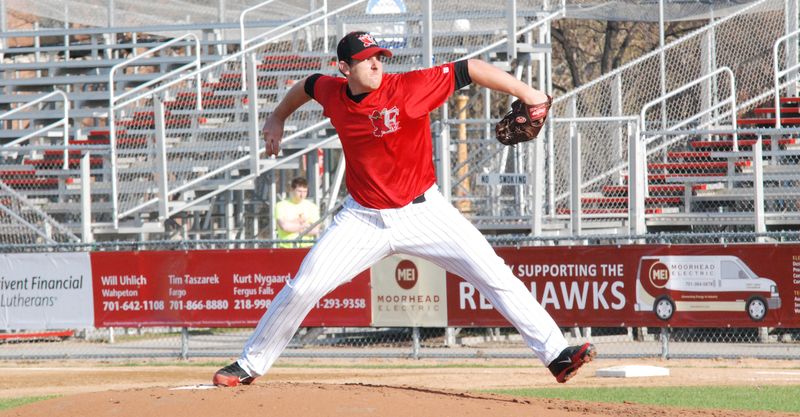 The Fargo-Moorhead RedHawks continue exhibition play against the Winnipeg Goldeyes at 6 p.m. Saturday, May 11, at Newman Outdoor Field.